Intuitive and efficient retrieval of motion capture data is essential for effective use of motion capture databases. In this paper, we describe a system that allows the user to retrieve a particular sequence by performing an approximation of the motion with an instrumented puppet. This interface is intuitive because both adults and children have experience playacting with puppets and toys to express particular behaviors or to tell stories with style and emotion. The puppet has 17 degrees of freedom and can therefore represent a variety of motions. 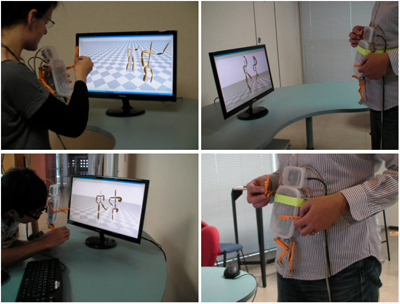 We develop a novel similarity metric between puppet and human motion by computing the reconstruction errors of the puppet motion in the latent space of the human motion and those of the human motion in the latent space of the puppet motion. This metric works even for relatively large databases. We conducted a user study of the system and subjects could find the desired motion with reasonable accuracy from a database consisting of everyday, exercise, and acrobatic behaviors. 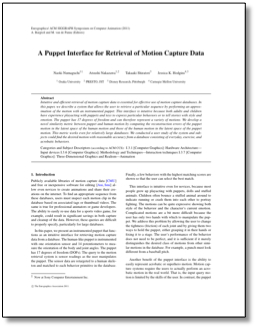 "A Puppet Interface for Retrieval of Motion Capture Data"
Comments, questions to Takaaki Shiratori. We support web standards; this page is valid XHTML 1.0 Transitional and CSS.